The newest edition of the Doctor Who Magazine is out this Thursday. Jammed pack with new interviews, features, giveaways and more. 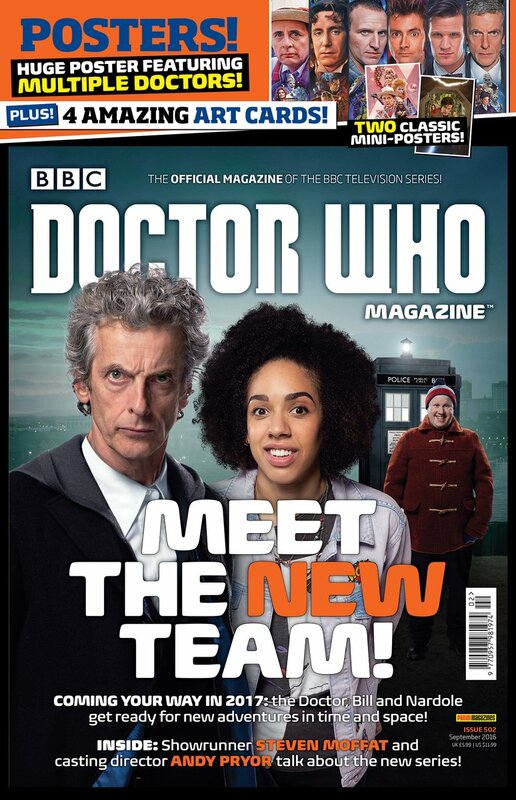 With the start of filming on Doctor Who series 10 this months focus and the cover is with the new TARDIS team – Twelfth Doctor Peter Capaldi, new companion Pearl Mackie as Bill and Matt Lucas who returns fresh from the 2015 Christmas special as Nardole. His head and body now successfully reunited. Steven Moffat is back along with casting director Andy Pryor as they talk about the new series and what is ahead for the new team. Also inside this month’s issue is the usual comic strips and competitions plus a fantastic poster featuring multiple Doctors along with some fabulous art cards and two more classic mini-posters. Doctor Who Magazine goes on sale this Thursday, 28th July. Price £5.99 UK and $11.99 in the US.